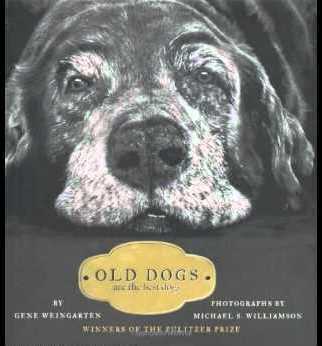 Below is an excerpt from the book Old Dogs: Are the Best Dogs by Gene Weingarten. They can be eccentric, slow afoot, even grouchy. 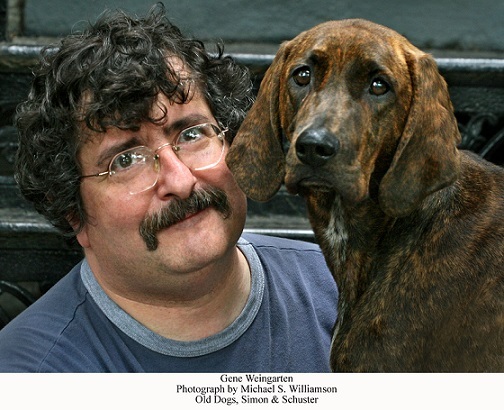 But dogs live out their final days, says The Washington Post’s Gene Weingarten, with a humility and grace we all could learn from. Not long before his death, Harry and I headed out for a walk that proved eventful. He was nearly 13, old for a big dog. Walks were no longer the slap-happy Iditarods of his youth, frenzies of purposeless pulling in which we would cast madly off in all directions, fighting for command. Nor were they the exuberant archaeological expeditions of his middle years, when every other tree or hydrant or blade of grass held tantalizing secrets about his neighbours. In his old age, Harry had transformed his walk into a simple process of elimination—a dutiful, utilitarian, head-down trudge. When finished, he would shuffle home to his ratty old bed, which graced our living room because Harry could no longer ascend the stairs. On these walks, Harry seemed oblivious to his surroundings, absorbed in the arduous responsibility of placing foot before foot before foot before foot. But this time, on the edge of a small urban park, he stopped to watch something. A man was throwing a Frisbee to his dog. The dog, about Harry’s size, was tracking the flight expertly, as Harry had once done, anticipating hooks and slices by watching the pitch and roll and yaw of the disc, as Harry had done, then catching it with a joyful, punctuating leap, as Harry had once done, too. 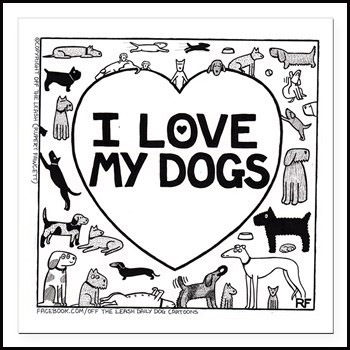 It’s no big deal to love a dog; they make it so easy for you. They find you brilliant, even if you are a wilting. You fascinate them, even if you are as dull as a butter knife. They are fond of you, even if you are a genocidal maniac. Hitler loved his dogs, and they loved him. Puppies are incomparably cute and incomparably entertaining, and, best of all, they smell exactly like puppies. At middle age, a dog has settled into the knuckleheaded matrix of behavior we find so appealing—his unquestioning loyalty, his irrepressible willingness to please, his infectious happiness. But it is not until a dog gets old that his most important virtues ripen and coalesce. Old dogs can be cloudy-eyed and grouchy, gray of muzzle, graceless of gait, odd of habit, hard of hearing, pimply, wheezy, lazy, and lumpy. But to anyone who has ever known an old dog, these flaws are of little consequence. Old dogs are vulnerable. 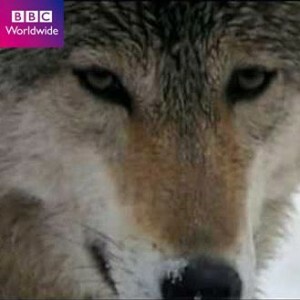 They show exorbitant gratitude and limitless trust. They are without artifice. They are funny in new and unexpected ways. But, above all, they seem at peace. Kafka wrote that the meaning of life is that it ends. He meant that our lives are shaped and shaded by the existential terror of knowing that all is finite. This anxiety informs poetry, literature, the monuments we build, the wars we wage—all of it. Kafka was talking, of course, about people. Among animals, only humans are said to be self-aware enough to comprehend the passage of time and the grim truth of mortality. How, then, to explain old Harry at the edge of that park, gray and lame, just days from the end, experiencing what can only be called wistfulness and nostalgia? I have lived with eight dogs, watched six of them grow old and infirm with grace and dignity, and die with what seemed to be acceptance. I have seen old dogs grieve at the loss of their friends. I have come to believe that as they age, dogs comprehend the passage of time, and, if not the inevitability of death, certainly the relentlessness of the onset of their frailties. They understand that what’s gone is gone. What dogs do not have is an abstract sense of fear, or a feeling of injustice or entitlement. They do not see themselves, as we do, as tragic heroes, battling ceaselessly against the merciless onslaught of time. Unlike us, old dogs lack the audacity to mythologise their lives. You’ve got to love them for that. The product of a Kansas puppy mill, Harry was sold to us as a yellow Labrador retriever. I suppose it was technically true, but only in the sense that Tic Tacs are technically “food.” Harry’s lineage was suspect. He wasn’t the square-headed, elegant type of Labrador you can envision in the wilds of Canada hunting for ducks. He was the shape of a baked potato, with the color and luster of an interoffice envelope. You could envision him in the wilds of suburban Toledo, hunting for nuggets of dried food in a carpet. His full name was Harry S Truman, and once he’d reached middle age, he had indeed developed the unassuming soul of a haberdasher. We sometimes called him Tru, which fit his loyalty but was in other ways a misnomer: Harry was a bit of an eccentric, a few bubbles off plumb. Though he had never experienced an electrical shock, whenever he encountered a wire on the floor—say, a power cord leading from a laptop to a wall socket—Harry would stop and refuse to proceed. To him, this barrier was as impassable as the Himalayas. He’d stand there, waiting for someone to move it. Also, he was afraid of wind. While Harry lacked the wiliness and cunning of some dogs, I did watch one day as he figured out a basic principle of physics. He was playing with a water bottle in our backyard—it was one of those 5-gallon cylindrical plastic jugs from the top of a water cooler. At one point, it rolled down a hill, which surprised and delighted him. He retrieved it, brought it back up and tried to make it go down again. It wouldn’t. I watched him nudge it around until he discovered that for the bottle to roll, its long axis had to be perpendicular to the slope of the hill. You could see the understanding dawn on his face; it was Archimedes in his bath, Helen Keller at the water spigot. That was probably the intellectual achievement of Harry’s life, tarnished only slightly by the fact that he spent the next two hours insipidly entranced, rolling the bottle down and hauling it back up. He did not come inside until it grew too dark for him to see. I believe I know exactly when Harry became an old dog. He was about 9 years old. It happened at 10:15 on the evening of June 21, 2001, the day my family moved from the suburbs to the city. The move took longer than we’d anticipated. Inexcusably, Harry had been left alone in the vacated house—eerie, echoing, empty of furniture and of all belongings except Harry and his bed—for eight hours. When I arrived to pick him up, he was beyond frantic. He met me at the door and embraced me around the waist in a way that is not immediately reconcilable with the musculature and skeleton of a dog’s front legs. I could not extricate myself from his grasp. We walked out of that house like a slow-dancing couple, and Harry did not let go until I opened the car door. He wasn’t barking at me in reprimand, as he once might have done. He hadn’t fouled the house in spite. That night, Harry was simply scared and vulnerable, impossibly sweet and needy and grateful. He had lost something of himself, but he had gained something more touching and more valuable. He had entered old age. On walks, he would no longer bother to scout and circle for a place to relieve himself. He would simply do it in mid-plod, like a horse, leaving the difficult logistics of drive-by cleanup to me. Sometimes, while crossing a busy street, with cars whizzing by, he would plop down to scratch his ear. Sometimes, he would forget where he was and why he was there. To the amusement of passersby, I would have to hunker down beside him and say, “Harry, we’re on a walk, and we’re going home now. Home is this way, okay?” On these dutiful walks, Harry ignored almost everything he passed. 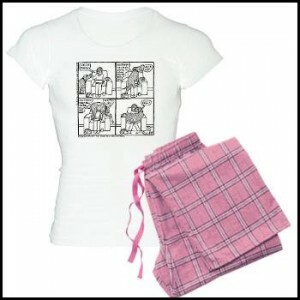 The most notable exception was an old, barrel-chested female pit bull named Honey, whom he loved. This was surprising, both because other dogs had long ago ceased to interest Harry at all, and because even back when they did, Harry’s tastes were for the guys. Still, when we met Honey on walks, Harry perked up. Honey was younger by five years and heartier by a mile, but she liked Harry and slowed her gait when he was around. They waddled together for blocks, eyes forward, hardly interacting but content in each other’s company. I will forever be grateful to Honey for sweetening Harry’s last days. Some people who seem unmoved by the deaths of tens of thousands through war or natural disaster will nonetheless grieve inconsolably over the loss of the family dog. People who find this behaviour distasteful are often the ones without pets. It is hard to understand, in the abstract, the degree to which a companion animal, particularly after a long life, becomes a part of you. I believe I’ve figured out what this is all about. It is not as noble as I’d like it to be, but it is not anything of which to be ashamed, either. In our dogs, we see ourselves. Dogs exhibit almost all of our emotions; if you think a dog cannot register envy or pity or pride or melancholia, you have never lived with one for any length of time. What dogs lack is our ability to dissimulate. They wear their emotions nakedly, and so, in watching them, we see ourselves as we would be if we were stripped of posture and pretence. Their innocence is enormously appealing. When we watch a dog progress from puppy­hood to old age, we are watching our own lives in microcosm. 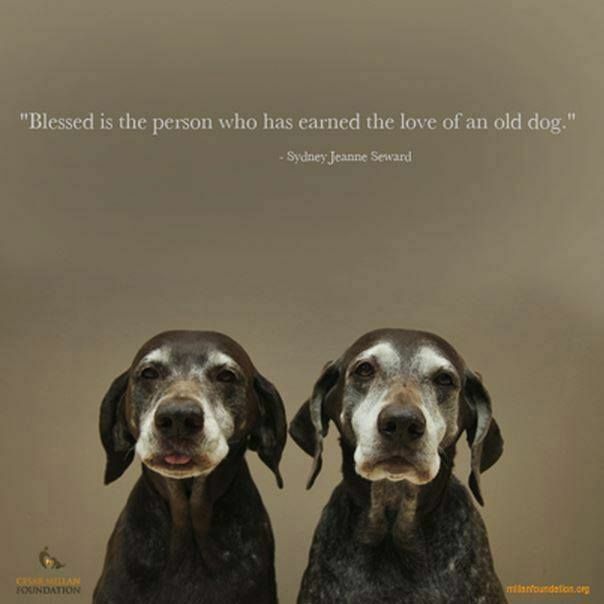 Our dogs become old, frail, crotchety, and vulnerable, just as Grandma did, just as we surely will, come the day. When we grieve for them, we grieve for ourselves.